It’s been almost two weeks since Motörhead Slot was launched at Leo Vegas. The brand new videoslot has been a huge success and the casino wants to celebrate – of course! Now you’ll have the chance to join Leo Vegas big rock festival if you think you’re ready to rock n’ roll. 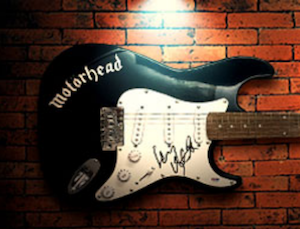 There are so many cool prizes up for grabs such as a guitar signed by no other than Lemmy himself as well as cash prizes and free spins on Motörhead Slot. Make sure you don’t miss out on everything that’s happening at Leo Vegas this month. If you click our bonus links you will be headed to Leo Vegas where you’ll find more information about the on-going promotions right now. If you want to go after the signed guitar you are going to visit the live casino at Leo Vegas where you will be able to claim tickets to the big draw. For every £10 you deposit and wager until the 24th of October you will be handed one ticket. You can claim how many tickets you want to. You can also claim extra tickets if you take a seat at Leo Vegas Celebrity Black Jack Party in the live casino. If you’ll get a special Ace of Spades card you will earn a new ticket. The lucky winner will be drawn on the 25th of October live on the same table as we mentioned earlier. The time is 8 PM. There’ll be a new competition with a new leaderboard each week at Leo Vegas during the promotion. One leaderboard is already finished and now there are four left. So you’ll have several opportunities to win cash or free spins at Leo Vegas this month. In order to climb the leader board you will have to play the videoslots in the series NetEnt ROCKS. For every £10 that you deposit and wager you will be given points and depending on how you play you will get a certain amount of points. If you play any casino game at Leo Vegas you will get 1 point and if you play any of the games Guns N’ Roses, Jimi Hendrix or Motörhead on your desktop you will receive 2 points. Last but not least you’ll get 3 points if you play the rock games on you mobile or tablet!